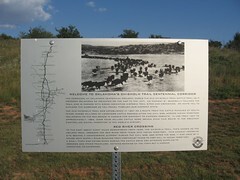 The Corridor, and Oklahoma Centennial Project, marks the Old Chisholm Trail, Cattle Trail as it crosses Oklahoma as indicated on the map to the left. US Highway 81 generally follows the Trail and is marked with signs indicating historic Trail sites and crossings. We invite you to explore the Corridor as you travel through our historic state. The Old Chisholm Trail was established in 1867 as a route from the cattle ranches of south Texas, where millions of longhorn cattle roamed after the Civil War, across Indian Territory (Oklahoma) to the railroads in Kansas for shipment to eastern markets. In use from 1867 to approximately 1885, over four million cattle were driven over this route in the greatest controlled animal migration in the world's history. To the east about eight miles downstream from here, The Chisholm Trail, then know as the Abilene Trail, crossed the Red River from Texas into Indian Territory. This ancient crossing site became a Confederate outpost during the Civil War, and after the War, it was used by a major Army supply road running from northeast Texas to Fort Sill in Indian Territory. A small town was established during the cattle drive era offering supplies to drovers and other travelers, nothing remains of the town but a marker indicating its existence. On Highway 81, .01 miles north of the Red River Bridge that crosses into Texas. 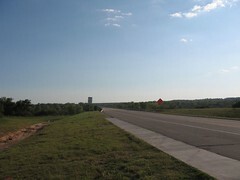 The marker is located on east side of road near the Welcome to Oklahoma Sign.